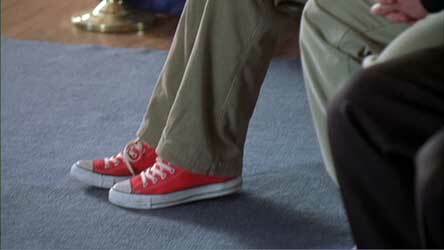 Ryan Reynolds wears red and black high tops and tan suede low cut Converse “Chuck Taylor” All Stars in the film. Mr. D inspires the student body and the faculty on the first day of school. Middle school is a difficult enough place to survive in, with students trying to deal with puberty, gain acceptance from their peers, and generally fit into the system. Oh, and on the way, maybe learn something too. This is especially true for seventh-grader Dylan Warner (Andrew Robb). We learn this quickly at the beginning of the film because the story of School of Life is presented from Dylan’s view, through voice-over narration. Not only is his father, Matt (David Paymer), a biology teacher at his school, but his grandfather was “Stormin’ Norman” Warner (John Astin), the Fallbrook Middle School’s most prominent teacher who won the Teacher of the Year award for the past 43 years. At last year’s graduation, Stormin’ Norman was suddenly stricken with a heart attack, and passed away. Now Matt is determined to keep up the tradition, and keep the award in the family. But Matt and Norman are very different personalities, and although Matt is optimistic about his own chances, Dylan is that age where he doesn’t want to be seen on campus with him and he is painfully aware that his dad isn’t very popular with the other students. 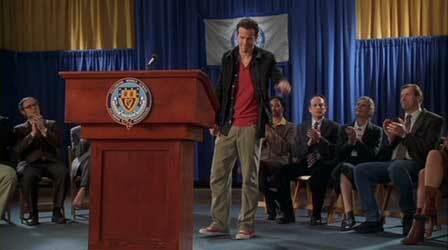 Matt’s chances are greatly diminished on the first day of school, when Norman’s replacement Michael D’Angelo (Ryan Reynolds) appears on campus and mesmorizes the student body with a cool opening day speech. The students stand and cheer, shouting “Mr. D, Mr. D” and a new legend begins. Mr. D is very different from Matt and the other teachers, because he seems carefully attuned to the needs of middle school students. He understands their awkwardness, their need for some independence, and he has an aura of charisma that naturally attracts them. 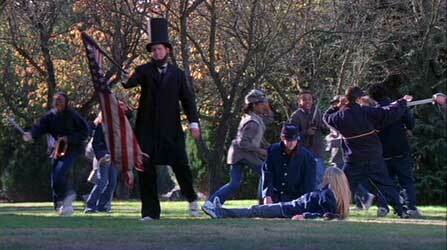 Mr. D is a chucks-wearing Abe Lincoln in a Civil War re-enactment for his history classes. Students feel priviledged to be in his classroom, and his methods are very unorthodox in comparison to what most of the other teachers are doing. Mr. D doesn’t have assigned seating, he often arranges his classroom in different formations, and likes to sit in the middle of a circle of students and fire questions. He makes the students respond by saying things that don’t always make sense, so that the students feel obligated to correct him or actually think about what they were saying. He also likes to pose interesting theoretical questions often touched with humorous asides so when he talks to a student, the student feels cool also. Soon what goes on in Mr. D’s classroom is the main item of discussion among the students at Fallbrook Middle School. Mr. D teaches his class in the round from a swiveling easy chair. As the film continues, the only one on campus not mesmorized by Mr. D is Matt Warner who is determined to find out more about him. Matt runs his class in the traditional manner, and is suspicious of what is going on in Mr. D’s class. This is compounded by Mr. D’s somewhat standoffish nature with the rest of the staff, even to the very attractive art teacher Denise Davies (Leila Johnson) who quickly develops a crush on him. Mr. D continues to provide innovative experiences for his class, like re-enacting a Civil War battle or simulating an archeological expedition like Indiana Jones. Things have become so upsetting for Matt that he even sneaks into Mr. D’s classroom one night trying to find something incriminating about him and later follows him around town to where he lives, which is in an inner city area of town. Mr. D does have a secret that affects his life, and eventually it is revealed in the story line. But to tell it here would spoil your experience of seeing the film. 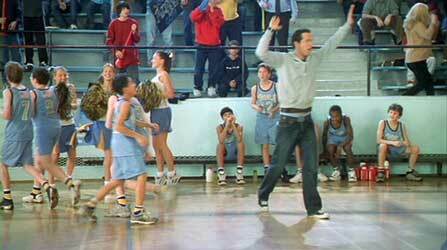 Mr. D inspires the basketball team to go ahead and actually win a game. Fallbrook Middle School is typical of what you might find in an affluent suburban area; it is presented as an established school with a tradition, and the students are clearly from prosperous families with educated parents. While this may seem limiting, it actually opens the door for real discussion about education, since the focus is not about students who are underpriveleged or from widely differing socio-economic backgrounds. It is unusual these days to find a film about a middle school that actually discusses education. Although many of the ideas and experiences are simplified and shortened, it is presented with some depth. This is especially true in the case of David Paymer’s performance as stuffy biology teacher Matt Warner. Although this part could have easily been made into a stereotype, the story line shows Matt Warner as a dimensional person, with good and bad traits, and really the film is more about his re-awakening as an educator than anything else. Paymer handles this difficult role very well. Ryan Reynolds is great as the charismatic Mr. D. This is a type of part that he excels at, and he plays Mr. D with a dry comic delivery that overcomes some of the less than scintillating dialog he is given to say. Some kudos to the supporting cast, especially the teaching staff, who are presented with personality traits that you often see (or imagine) that middle school teachers must have. These cast members include Leila Johnson as the attractive art teacher who has a crush on Mr. D, Brenda McDonald as the veteran math teacher with sardonic lines, John Astin’s cameo as the great Stormin’ Norman Warner, and Paul Jarrett as the English teacher decrying the end of the language as we know it. Director William Dear keeps the film moving as a quick pace, and while this film doesn’t end up being a great film, it is a very good one for its subject matter and intended audience. It doesn’t gloss over elements of life and death that appear in the script but shows them in a way that is moving and empathetic to the audience. It presents views about education from both the students’ and teachers’ viewpoints. As a result, School of Life is a family film that leaves you with a positive feeling about life and an interesting glimpse into the public school system. Mr. D puts his foot down, or up, to discourage cheating during a test. Mr. D wears chucks every day, but on the opening day of school he wears red high tops. 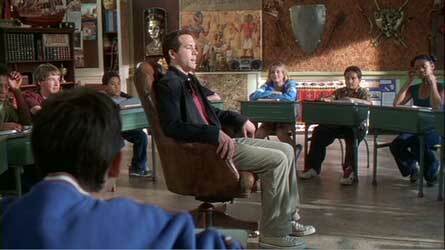 Ryan Reynolds, in his role as the inspiring teacher Mr. D, wears chucks throughout the movie. Wearing chucks is part of his cool personality. He sports several pairs, including red high tops, tan suede low cuts, and black high tops. The best scene is on the first day of school, when Mr. D appears at the opening school rally wearing red high tops. The camera focuses on them before we actually see Mr. D, but already we know that this guy is going to make a statement on campus. The first shots we see of Mr. D at the assembly are closeups of his red high top chucks. School of Life. (2005) Ryan Reynolds, David Paymer, Kate Vernon, John Astin, Chelsea Florko, Andrew Robb, Don McKay. Directed by William Dear. Categories: Drama, Comedy, Family.